The heart lunges, it hungers, it leaps. I’ve seen it try and pour itself out in saving others or giving to others in a beauty that is unrecognized by the fearful, the hurt, the hungry. They lash out against the heart’s beauty. They misunderstand. I get the beauty, but of course, I compare. Me to her. Me to him. Aren’t I silly for doing that? What’s to compare? Their uniqueness shrivels my plainness? Or does my beauty shine a hue that differs from their rainbows? 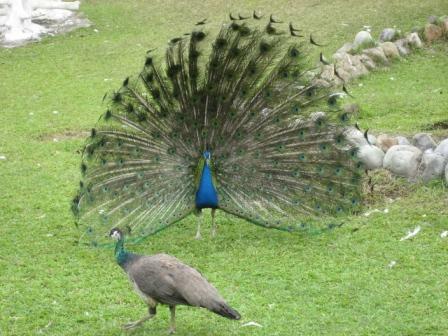 Take the strutting peacock, for instance. That’s just the male. The female, the one he’s strutting for is plain and mousey by comparison. Which begs the question, if you follow, does the male with his bright feathers, tips in bright, bold eyes, think he is beautiful? Or does he strut because he is ugly until chosen? Perhaps it’s far simpler. His DNA is programmed for bright hues and strutting and her DNA is programmed for simple, plain, protective style that melds into the ground cover, hiding there to protect the young, making the nest look enticing to the fabulous, plumed, brilliant, stunning MALE. And so they choose and so they mate and so the breed continues. They did what they were born to do. They follow instinct and fulfill their destiny. I get tripped up in the search for my destiny versus some other person’s destiny – hers or his; my potential versus hers or his; the choices, the options are myriad. Too many to comprehend and embrace. Perhaps that is why I get nothing done and accomplish squat. Which way to go? Which dream to follow? Which heart to embrace? I ponder and try to reach beyond the sameness of this morning. Nothing new there; it’s the common challenge as the everyday breathes on all sides. I call to Mother and she comes to my desk, slowly, her balance steadied by her footed cane. Sun shines its morning glow through the eastern window with a glisten on the gray streaks in her dark hair. “I know,” I rise from my folding chair and help her get seated. “Just this one; you’ll love it,” I maneuver the laptop so that Mother can see. My nephew’s wife posts pictures of their two girls, toddlers, on her facebook page. In this picture, the littlest one grins, every inch of her body covered in happiness, her big blue eyes saucers of joy. Her older sister looks shyly at the camera, her smile demure, her big blue eyes tentative. They’re both dressed in ruffled, polka-dot cotton shirts and tot sized blue jeans. We look at several pictures until Mother pushes herself upright and with careful moves of her cane, returns to the kitchen. There’s a slight lift to her movement. She drank in the beauty of two new little lives, health’s glow on their skin, bright eyes, fluffy hair and pint-sized outfits. She doesn’t feel any better than she did before; it’s the beauty that has lifted her. She’ll get her breakfast a little easier now. So shall I compare my beauty to theirs? To some artist? Shall I stifle the creativity that I didn’t know was there because it looks different from all others? I find myself picking at our differences. I see the lack in my creative well. I feel drab and useless. I am ineffectual. I am not an artist. It’s no good stopping at that sore spot. The lack is too painful. I push on. I seek the truth. I dig until I find it. Or it finds me. God programmed their DNA. God programmed my DNA. I’m not the artist she is or he is. I am my own artist. I will take my cue from Mother. Absorb the beauty, let it escape the synapses of my gray matter to run down my arms and spill out through my fingers. I will create.